Venue decor for weddings at The Hare & Hounds, Westonbirt? For wedding breakfasts and evening receptions in the Westonbirt room we can installl fairy lights in a stunning canopy effect. We can also include bunting with the lights if required or if you have your own bunting we will put it up for you when we install the lights. 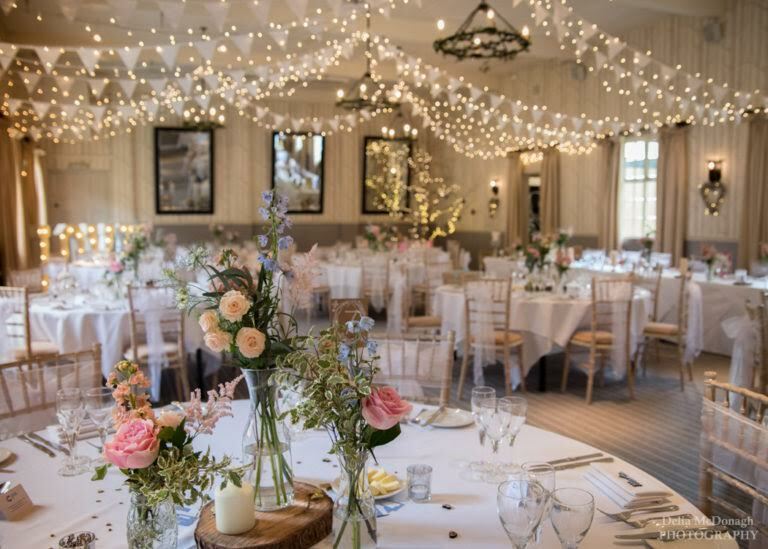 We plan to install the lights early on the morning of your wedding however if the Westonbirt Room is available the day before it can sometimes be an option to install the lights then. 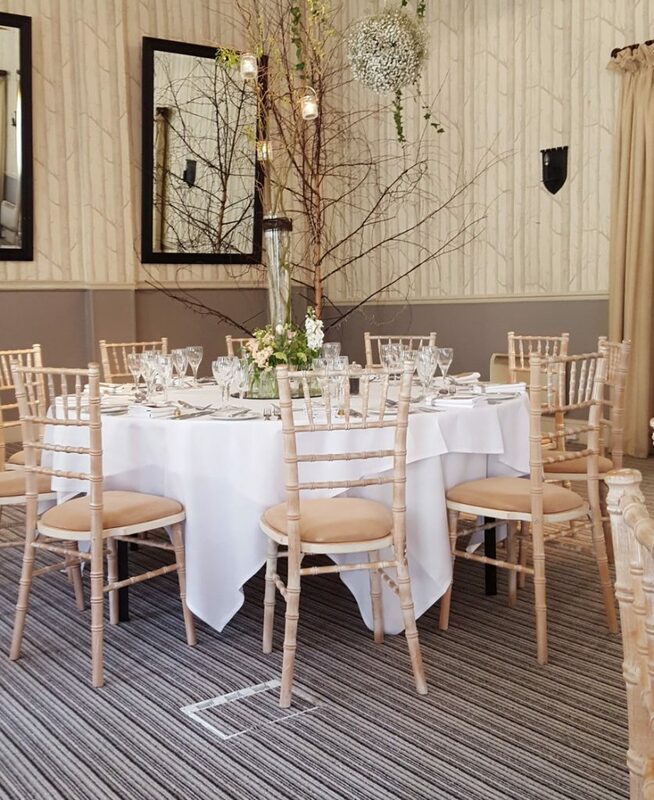 Our elegant limewash chiavari chairs are a great alternative to banquting chairs at The Hare & Hounds and can be used for indoor or outdoor ceremonies along with your wedding breakfast and evening reception. Our range of sashes including over 80 different colours of organza sashes, vintage floral sashes, hessian sashes or lace sashes are a great way to accessorise the chairs if required. We can also supply gold or silver chiavari chairs which are very popular for winter weddings. 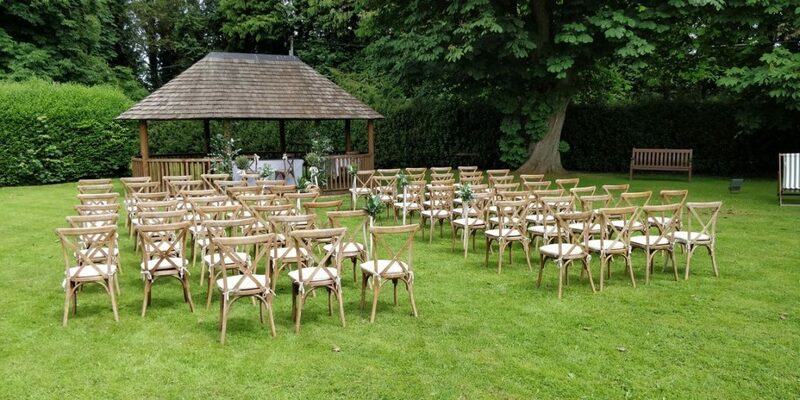 Our rustic oak crossback chairs fit in perfectly with the wooded surroundings at Westonbirt and are extremely popular for rustic/vintage styled weddings. These chairs have a stunning lighter grained effect giving them a rustic look and each chair is supplied with a linen tie on cushion. 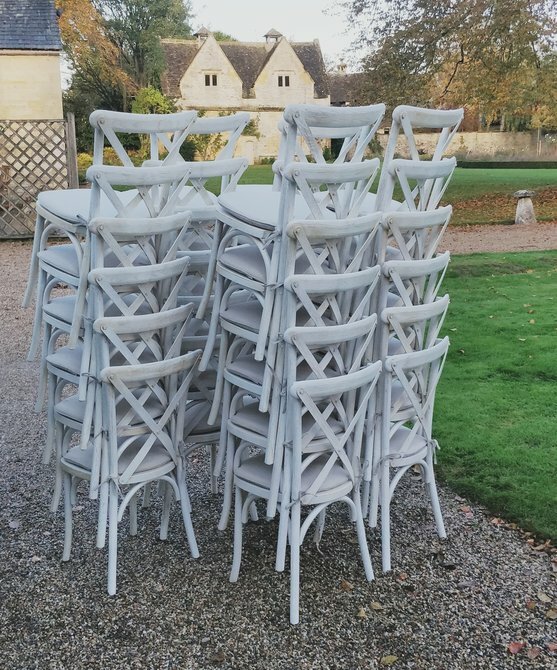 When supplying chairs at The Hare & Hounds we always plan to deliver the chairs early on the morning of your wedding however in some cases it is possible for us to deliver the chairs the day before. The most popular location for our light up letters at The Hare & Hounds is close to the dance floor area. Putting the letters on a slight curve at the back of the dancefloor works really well and creates a great backdrop to the dancefloor – and they look great in photos! We can spell any word you like, popular choices include spelling your initials, LOVE, Mr & Mrs or spelling your surname in large letters with a small Mr&Mrs on top. New for 2018 – our whitewashed oak crossback chairs are the same size and style as our rustic oak crossback chairs but have a whitewashed finish giving them a lighter appearance. These chairs are supplied with a linen tie on seat pad and proving a very popular alternative to the ever popular limewash chiavari chairs. 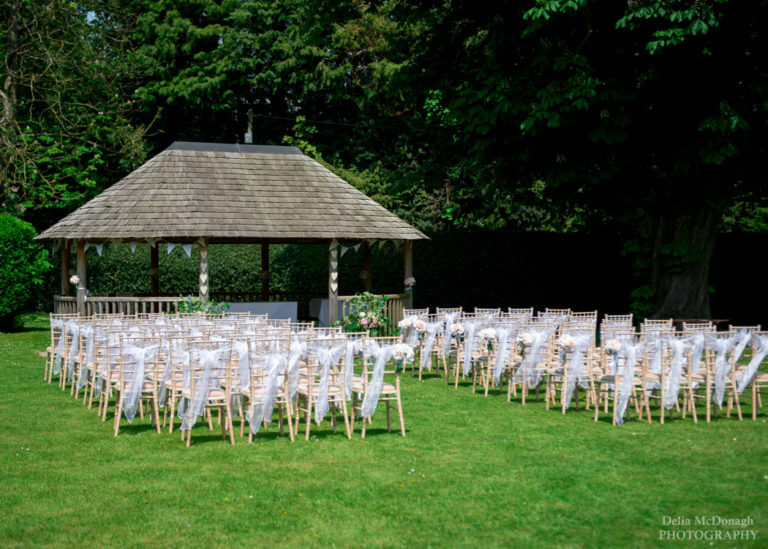 All our chairs can be used at The Hare & Hounds can be used for indoor and outdoor ceremonies, wedding breakfasts and evening receptions. If the chairs at The Hare & Hounds aren’t to your taste then covering the chairs with our chair covers and sashes is a great option. We have cotton chair covers available in white and lycra chair covers available in white, ivory, black and royal blue! To accompany the chair covers we stock over 80 different colours of organza sashes, vintage floral sashes, hessian sashes and lace sashes. Sometimes photos of the different colours of sashes aren’t quite sufficient so we offer free sash samples, just let us know the colours you are interested in and we will get them in the post to you. If your evening reception is taking place in the restaurant then we can wrap fairy lights around the high timbers. A simple yet effective way of creating the right lighting for your reception.